Belvoir's Wild Duck (after Ibsen) is garnering praise and more praise in London, not exactly an easy gig. It played here a few years ago, and we missed it. I was determined not to let the also much admired new production of The Glass Menagerie slip through our fingers, and fortunately scored some great seats in the centre block, not yet mindful that the side seats have some restrictions. We saw a thing of delicate and fragile beauty, almost transparent with wafting gauze, wisps of smoke, shadows and corners, windows and curtains, in subdued colours and with monochrome video projections onto side screens where close ups and lingering moments of exquisite beauty added a dimension of almost hypnotic quality as illusion's truth was increasingly exposed. It's like watching a beautifully shot 40's black and white film while the live version is slowly played out on a soundstage which itself could all but disappear with the next thunderclap, and everyone with it. 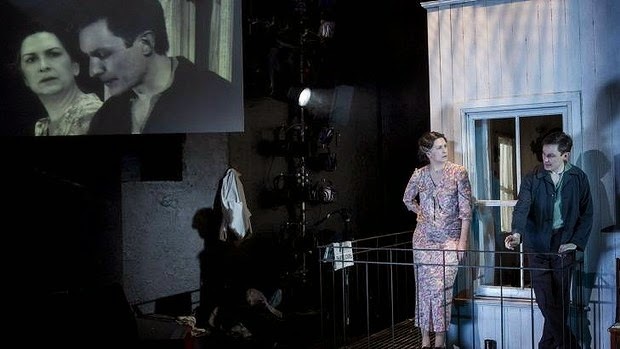 The lovely thing for me about this production (and we were both seeing the play for the first time, really) was the love that somehow was managed to be infused into the characters whose sometimes achingly sad inadequacies were nonetheless driven by what was thought in another's best interest. No freaks here; just frail humans. I especially liked Rose Riley's Laura/ Rose. "No freaks here; just frail humans." Great closing line to sum up this experience. Your determination to get tickets after missing one feted production is something I certainly recognize. I managed to miss a superb Peter Grimes some time back and vowed not to miss the next Britten work to come my way. It did tonight in the form of Curlew River. Haunted and haunting (and I don't say that simply because it's Halloween here). Sue, I'm with you. Curlew River was my introduction to Britten when the English Opera Group toured here in 1969 with a production even more spare than the one you saw. It was an experience difficult to explain now, in its depth. And other than that, it also compelled me to seek out Noh Theatre, in Tokyo, Shibuya. I'd go even further than Sue and say that all this pertains exactly to their stupendous, shatteringly moving Wild Duck: 'the love that somehow was managed to be infused into the characters whose sometimes achingly sad inadequacies were nonetheless driven by what was thought in another's best interest. No freaks here; just frail humans'. I'd go to anything they do if I were there. It's such an ensemble.